Hometherapy Are You Just About To Put Your Shoes Back On? When they’re healthy and happy, you don’t give them a second thought; they’re simply an unappreciated source of freedom. But with their 200,000 sensory nerve endings offering instant feedback, that nihilism is instantly extinguished when pain strikes. From not giving them, or their existence, a second thought you’re propelled into proactive ‘problem solving’. 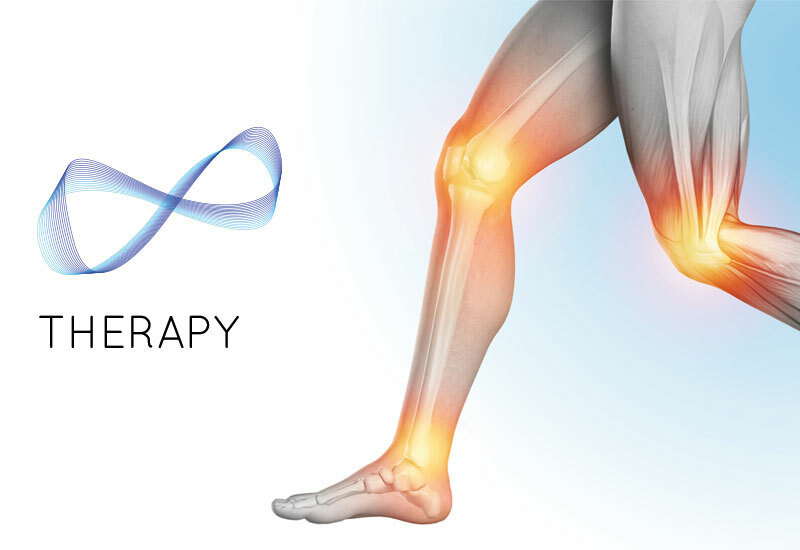 Traditionally, that might have involved a trip to the chemist, GP, chiropodist or podiatrist, resulting in a variety of solutions from gel cushions, anti-inflammatory drugs and arch supports to custom-made orthotics. It’s interesting don’t you think, that we recognise restriction in all other garments. Corsets restricting breathing, tight sock cuffs restricting circulation, tight jeans precluding the ability to sit down, tight jackets restraining shoulder mobility. We also seem to blindly accept that the shape of our feet seems to pretty much match the shape of our shoes when we take them off. Is it a foot? Or is it a shoe? But are shoes feet-shaped or are they shaping our feet? Feet are actually more V-shaped than most realize. The mid-foot bones flare from the heel bone, and the long foot bones continue the ‘fan’ shape towards the toes. 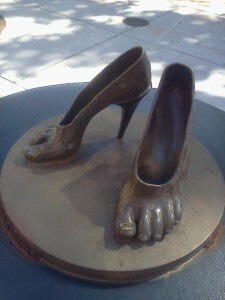 In a foot that’s never been restricted by a shoe, the broadest part of the foot is from the big toe to the little toe. Most people won’t even need to check their wardrobe to know that none of their shoes have a toe-box that’s at least as wide as the space across the ball of the foot. But aren’t we advised to “Avoid walking barefoot to help protect your feet from injury and infection”? Well, by some, but not all … and not me! Feet have some 34 muscles present, 2 of which are operating to their capacity when wearing stable shoes. With shod feet doing so little, it’s no wonder that we hear talk of prescriptive foot ‘exercises’. But feet are weight-bearing with every step, so how bizarre is that concept? Imagine how strong you’d be lifting your bodyweight with your arms 10,000 times per day? Make life easier – take your shoes (and socks) off regularly and move around. Bare, spreading, working feet will give themselves all the exercise they need. Swap oval-ended socks for toe socks. Individual toe pockets give toes a little more space and encourage the toes to relax, making them more comfortable than ‘regular’ socks. The foot is innately strong. It has 3 arches. Arches are the strongest engineering structure known to man. You do not support an arch with a post or pillar – that would weaken it. An arched tunnel NEVER has a pillared section. The Underground simply couldn’t exist if each tunnel had to be supported in the middle. Reconsider your approach to arch supports for your feet. Think logically. Severely deformed feet might need them, but the majority don’t. The majority of shoes however, have arch supports built into them. Just remember that next time you go shoe shopping. Fear of puncture wounds from glass, fear of infection from dog poo … we hear it all the time, and when we suggest using ‘eyes’ as a self-protective mechanism, the worrier laughs and stops worrying. We are encouraged to over-think and over-protect. Relax – as it happens, we’re better designed than you realise. The skin of feet is designed to be tougher, more resilient, thicker without losing sensitivity, pretty puncture-resistant, and yet remaining pliable, without callouses or danger of cracking – like tanned leather. Wrapping feet up in airless greenhouses unnaturally softens the skin, in part because of the moisture present from the 250000 sweat glands (more than anywhere else in the body). Taking your shoes off regularly, airing the skin and using the skin as it was designed, will encourage it to become as nature intended. Self-protective. To fix pain, you need to know the cause of it. It’s no different with feet. An arch support may alleviate the pain, but if the pain is still present when the arch support isn’t there, then the cause of the pain still is! Relying on support in the long-term is just the same as immobilizing any other joint. Illogical. Flat feet. Reframe this description if it applies to you. Instead of thinking of them as inevitable, or hereditary, or your ‘lot’, think of them as ‘currently weak’. 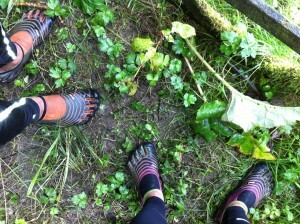 Challenge the weakened muscles by going barefoot regularly, or wearing ‘simulated barefoot’ or ‘minimal’ footwear. They WILL get stronger. We do things with our feet unthinkingly, because we can’t feel what’s happening to them when wearing shoes. If barefoot, or in minimal or ‘simulated barefoot’ footwear, you would no more use your heel bone as a hammer than fly to the moon. Over-striding, impactful forward motion couldn’t exist, because it would hurt.We do however, over-stride and have impactful forward motion when wearing cushioned shoes/trainers. So where does the impact go? It can’t just disappear. Newton’s Third Law of Motion says ‘for every action, there is an equal and opposite reaction’. Whilst your feet, nicely swaddled in a blown EVA cushion, might not feel the impact there and then, it exists and the joints above will notice after a while. Walk briskly along a short distance of pavement with your shoes on. Now take them off and repeat. If you move in exactly the same way, it won’t be pleasant. Most will, and almost instantly, adjust their movements (gait) to make it more comfortable. Self-preservative instinct is at play, part of the dance of evolutionary movement, and it defines posture.Postural muscle tone is our heritage. Think about reclaiming it in the easiest way possible – via the messages from your feet. – a more gentle approach will be more comfortable, and sustainable. Take your pointed shoes and oval-ended socks off whenever you can, and start searching for logical answers to footwear needs. There’s a whole world of ‘simulated barefoot’ shoes out there, all with the same goal – to let feet be feet – the strong, adaptable, flexible structures they’re designed to be. Seek information and assistance from happy heretics with strong feet and bodies. You’ll find them talking in your ear with the body-friendly Walking and Efficient Running coaching downloads from Barefoot Audio, and residing at Ten-Point, the Efficient Running & Cycling Studio in Chesham Bois.